How much of a cynic are you? Something happened today as we put the ashes of my grandfather into the ground, almost a year after his funeral. This time there were fewer of us present, just my aunt, me and a caretaker from the crematorium, dressed in a cheap and badly fitting costume. We didn’t sing, we didn’t read poems, we didn’t perform a ritual. We just poured the ash into the hole that was dug and that was it, the aftermath to a 96 year long life that finally had ended. Somehow the trouser incident helped to clear the air. Whatever complications that lingered in our family history, whatever shadows my grandfather had cast over us, it was all gone by now, swept away by the everydayness of the situation. Here we were: three people, a jar of grey dust and a pair of newly diseased trousers in a small pocket of stillness before life would proceed to its normal routines. Sorry, I know this is a winded way to introduce a movie. I’m already at 1 500 characters and I haven’t mentioned its name! We’re not even close to a theatre; I’m leaving you hanging in a memorial park out in nowhere. But it is related, I assure you. Stay calm! 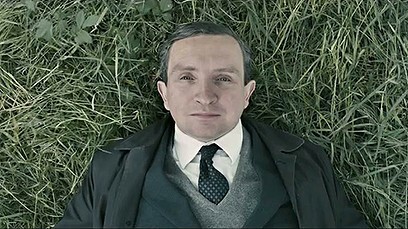 What I’m doing here is to try to put us in the right mood to talk about Still Life, which is a lovely little movie about death, loneliness and what it means to be human. Who knows what else you’ve been reading before getting to this post? Maybe your thoughts are still lingering at a rant you read about the latest blockbuster. A brief stop at the scene at the graveyard can serve as a bridge over to facts of life that we rarely think about for too long: that we die alone and that we only leave every so few traces behind us. In a hundred years, it’s unlikely that there will be anyone remembering, talking or caring at all about this person who once existed. I’m pretty certain there are people out there who will have objections against how the movie ends. Let’s put it this way: it does bring things in a direction that at least I hadn’t considered, and in a style that will reveal how much of a cynic you are. I went for it. I can see why others won’t and that’s ok.
You know, in the end we’ll all be dust some day and no one will remember us or our little online disputes about movies. In that we’re all equals, each one locked into their lifeline, born alone, dying alone. All we can do is to cherish whatever little moment in life we encounter for what it is. Even when it’s such a small thing as to share the joy over a new hole in a pair of trousers with a caretaker. Beautiful post. And sorry about your loss.